Shree Datta SSSK Ltd., Shirol has set up a separate wing of Cane Development Department in 1987 for carrying out the cane development activities within the area of operation. For the said work we have appointed qualified 79 Agri. personnel. We have appointed one Agri. Assistant for every 200 acres cane area. The Agri. Assistant gives advice to the concerned cane growers from land preparation for cane planting upto harvesting. They are in close contact with the cane growers at the village level. They give them ideas about new technology in sugarcane cultivation and motivate them to accept the same, which enable to increase per hectare yield in economical cost of cultivation. In order to discuss and update the cane cultivation knowledge of cane growers and give them information of new technology in sugarcane, the CDO, Agri. Overseer conduct the village wise meeting. This is helping to increasing the yield per hectare and good quality cane for crushing. Besides this the relations of the cane grower members with Karkhana is being maintained cordially. Factory implemented various cane development activities thinking with a view to increase per hectare yield by reducing cost of cultivation and keeping soil in good fertile condition. To check the fertility level of soil, factory set up Soil Testing Laboratory in 1987 having advanced soil-testing equipment such as ATOMIC ABSORPTION SPECTROPHOTOMETER. Soil samples are collected at the time of land preparation for cane cultivation by Agri. Assistant and analysis reports are given to the members prior to planting sugarcane. pH, Electric conductivity, organic carbon, calcium, nitrogen phosphorus, potash, zinc, ferrous, manganese, these element level are checked in laboratory and recommendations are given. Irrigation water used also analyzed. Sugarcane leaf analysis is done one week before final earthing up. On the basis of all these analysis the recommendations of chemical fertilizers and organic manure are given to the farmers. Farmers are accustomed to apply fertilizer according to soil, water and leaf analysis and found increase in crop yield. The Management has proposed to start Testing Physical Properties of the Soil from this year. Soil, plant, water samples of cane grower members is analyzed by the factory free of cost. For testing the Nutrient deficiency in field, Factory purchased Chlorophyll meter which given information about nutrient deficiency within 5 minutes at field site so that immediate nutrient application is possible for better yield. 1. 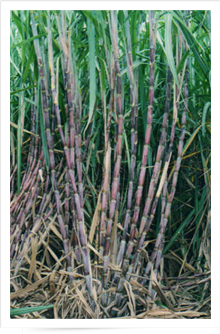 By implementing various cane development activities, the crop yield increased by 23 MT/Ha. Five Farmers are awarded by VSI, Pune as OOS BHUSHAN for taking highest yield per Hectare in the State of Maharashtra. 2. For implementing various cane development activities on large area, factory awarded by Vasantdada Sugar Institute, Pune [VSI] for Best Cane Development Activity for the year from 2000-2001, 2001-2002 & 2006-2007. 3. 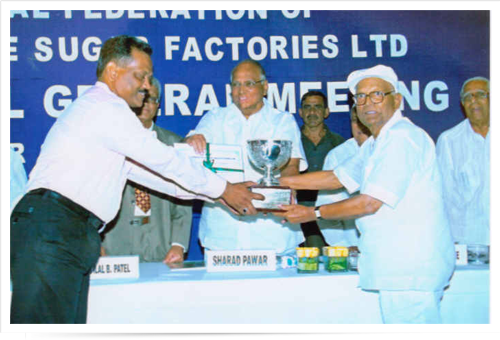 For Best Cane Development and its Management, Factory Awarded by National Federation of Co-op. Sugar Factories Ltd., New Delhi in 2007-2008. 4. For implementing Cane development activities on large area with positive results in crop yield, VSI awarded our Cane Development Officer as BEST CANE DEVELOPMENT OFFICER in Maharashtra State Sugar Factory level.